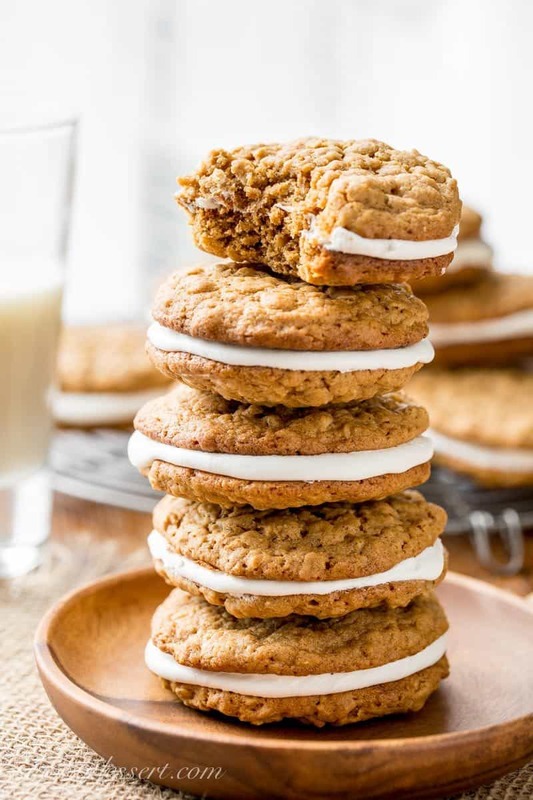 Oatmeal Cream Pies – soft, chewy oatmeal cookies with hints of cinnamon, molasses and coconut, with a sweet marshmallow cream filling. So … I was doing really good until these happened. 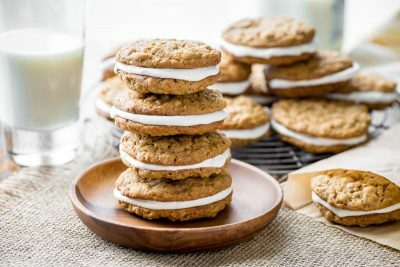 I’ve been working on a recipe for Oatmeal Cream Pies for years, probably since I started blogging in 2010. The recipe finally came together and, well, there they are. Soft and sweet, loaded with molasses and cinnamon, and a creamy, sticky, delicious filling. They may not be exactly like the famous Little Debbie version, but my family said they are very close. I couldn’t just trust their opinion however, I had to make sure. I would never want to tell you something is terrific, unless I actually taste-tested the recipe, and taste-tested it again. Okay maybe three times. 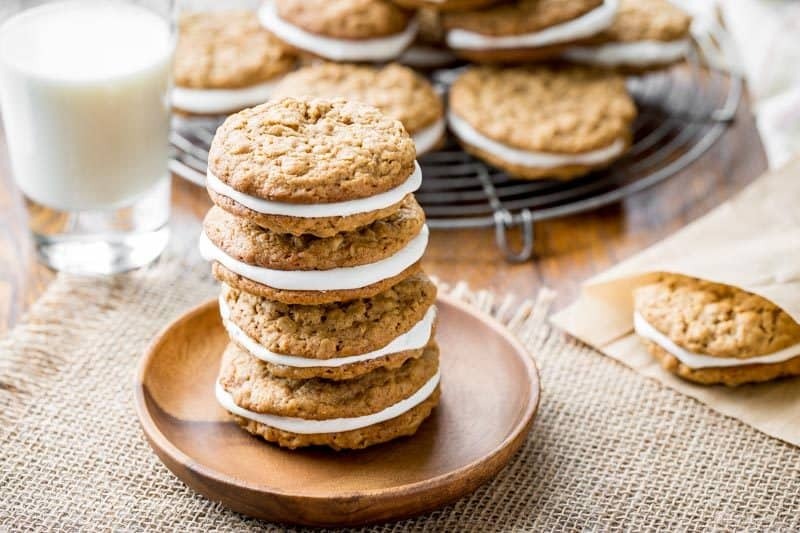 Did you know Oatmeal Cream Pies were the very first snack cake baked by McKee Foods back in 1960? I grew up about 8 miles from the McKee Foods headquarters so we could practically smell them baking all those wonderful treats. When we were little our father sold group health insurance for a local Chattanooga company. One of his clients was McKee Foods, and every once in a while, dad was invited to shop in the company store with their employee discount. How happy we were to go shopping in a store filled with nothing but Little Debbie Snack Cakes! Mom and Dad let us pick out a few boxes of our favorites to pack in our school lunch. Funny how those food memories stick with you. I was, and still am, a die hard chocolate fan but would never turn down an Oatmeal Cream Pie! I bet you could make some of these for your back-to-school kids and they’d be more excited about getting up early. They just might be the envy of their lunch table friends, and the other kids may be wondering why their moms don’t bake like you. 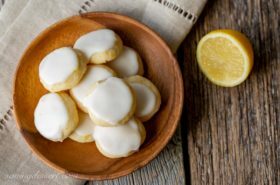 These cookies are easy to make and keep great in the refrigerator for days … if they last that long. If you try our recipe, please use the hashtag #savingroomfordessert on INSTAGRAM for a chance to be featured! FOLLOW Saving Room for Dessert on FACEBOOK | INSTAGRAM| PINTEREST | TWITTER for all the latest recipes and updates. 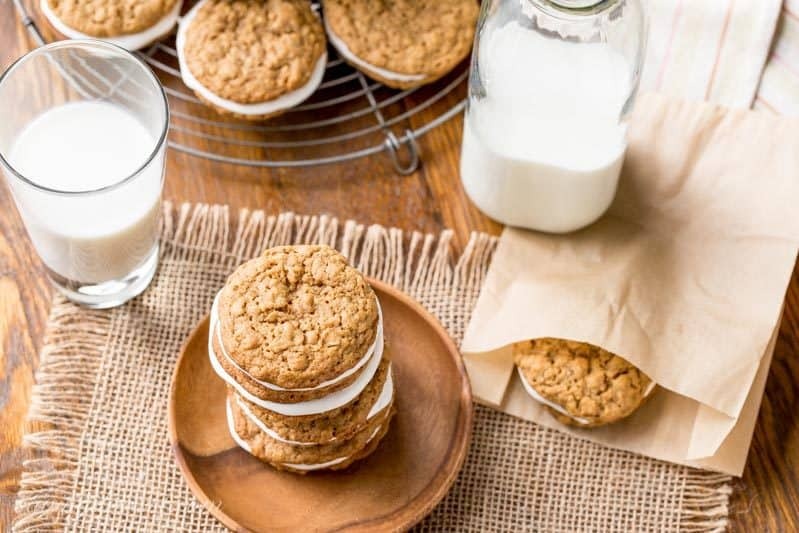 Oatmeal Cream Pies - soft, chewy oatmeal cookies with hints of cinnamon, molasses and coconut, with a sweet marshmallow cream filling. Preheat oven to 350 degrees. Prepare 2 baking sheets lined with parchment paper. Add the rolled oats to a food processor and pulse 10 times. Don't over process because you need a variety of textures. In a large mixing bowl, combine the oats, flour, baking powder, soda, salt, cinnamon and nutmeg. Stir to combine. Set aside. In the bowl of a stand mixer, beat the butter on medium-high for about 30 seconds. Add the brown and granulated sugars and mix on medium-high until the batter lightens and becomes fluffy. Add the eggs, one at a time, beating just until the yolk disappears. Add the molasses, vanilla and coconut extracts and mix on low until incorporated. Add about 1/3 of the oat and flour mixture to the creamed sugar and eggs. Mix on low just until blended. Continue adding the flour mixture until it is fully incorporated. Using a 2-tablespoon size cookie scoop (scant - not heaping), roll the dough into balls and place on the prepared baking sheet at least 2-inches apart. You should be able to bake about 6-8 cookies on each pan. Bake for 10 to 12 minutes or until the bottoms just begin to brown. The middle may look a little unbaked, but not wet. Remove the pan from the oven and allow the cookies to rest for 5 minutes before removing to a rack to cool completely. Repeat with the remaining cookie dough until all are baked. Match up similar sized cookies to create a sandwich. You should have a total of 32 cookies or 16 sandwiches. 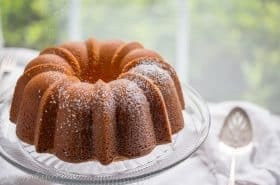 In a medium mixing bowl combine the butter and powdered sugar and beat with an electric mixer until fluffy. Add the vanilla and salt and beat until blended. Add the marshmallow fluff and blend on medium-low until incorporated, about 2 minutes. Spread the filling on the bottom of half the cookies. Top with another cookie and press gently to spread and seal. Store cookies in an airtight container in the refrigerator for best results. If you have leftover filling, sandwich between graham crackers for a simple treat. Do you have cookie monsters in your house? I think everybody loves a great cookie every now and then! These Homemade Fig Newtons are another one of our favorite copycat cookie recipes. I also love these delicious Peanut Butter Sandwich Cookies with a robust peanutty flavor and smooth creamy filling. How about these beautiful copycat Mrs. Fields Chocolate Chip Cookies from Averie Cooks! Cooking Classy stole my heart with these Copycat Samoa Girl Scout Cookies – they look amazing! And finally, for a super simple delicious treat, try these Homemade Thin Mints ~ from The View from Great Island. Our grandson Isaac starts kindergarten this year so I know he’ll want something delicious in his lunch box. I can’t wait for school plays, sports and all the other fun things that go along with kindergarten. And, as grandparents, we don’t have to worry about homework! Yeah! Thanks so much for stopping by! I don’t see many cream pies that often and I’ve only had it a couple of times but they are so memorable. I know yours would be amazing. I love the textures from the oats and that creamy filling. I want to make some of these right now! Thanks Monica! I hope you get the chance to make them – they are so good 🙂 Have a terrific week! Good thing it only makes 16 sandwich cookies – enough to enjoy and share! Thanks Susan – have a lovely weekend. These were a childhood favorite of mine, too! But I have a feeling your homemade version tastes 100x better!! I can’t lie about these Liz – they really are terrific! Sweet for sure, but oh-so-good 🙂 Thank you! I have not, nor will I ever outgrow oatmeal cream pies. 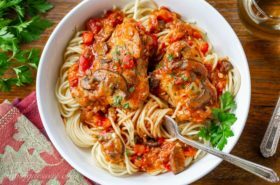 Especially with improved recipes like this! Cannot wait to try this out!! Tricia..I love oats..and these look AMAZING..but I want you to make them for me:) And we would eat 2 together..
We should make them together and eat a few for sure! Such fun that would be. Can’t wait to see how they turn out for you. I know your little men will enjoy them … a lot! I want these in MY lunchbox! You’re giving Little Debbie a run for her money- they look scrumptious. ???? That made me smile Betty! Thank you so much. I guess you are getting ready to start back to school. This summer went by fast 🙂 Hope you have a great year! oh my has it been a long time, I remember these beauties. Perfect for after school snacks and great with tea in the afternoon, love these!! 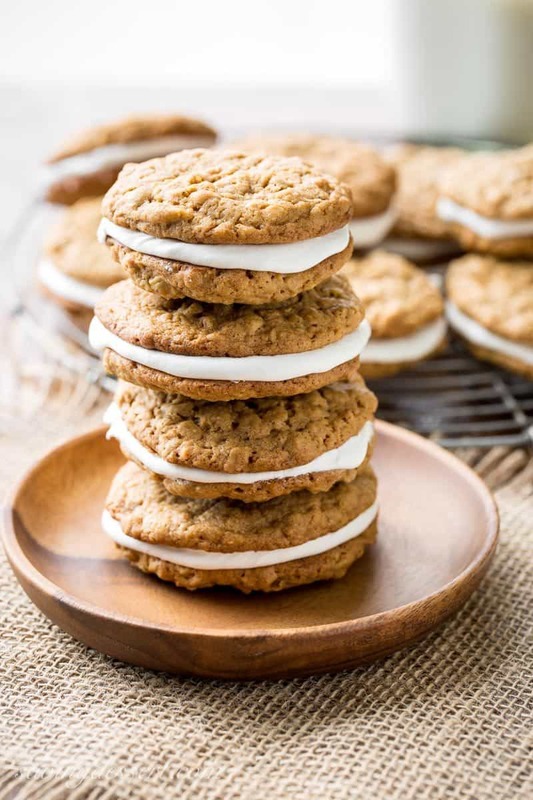 Hi Tricia, The oatmeal cookie recipe is amazing, yet the filling with added marshmallow creme I do not use because of it’s artificial ingredients. Is there another item I can use like butter and vanilla bean paste or alcohol free vanilla flavor? Sure – I would just make a simple buttercream icing and go with that. Do you mean use vanilla bean paste instead of the coconut extract? The cookies are great even without the filling so a few alternations won’t hurt. Thanks! Thank you, Tricia, for helping me with the filling ingredients. I do use organic vanilla bean paste and vanilla flavor sans alcohol. the buttercream will be delicious in between the oatmeal cookies and even, like you said, all by themselves too! Hope you love them as much as we do – and thanks! I would share them with you if we were neighbors Sue – but you may have to fight the family for them. Little Debbie Snack Cakes are a southern thing I’m sure – maybe next time you’re in the south you’ll give one a try! Thank you! These look delicious! I loved these growing up and I made a different recipe years ago. Looks like your recipe is the perfect excuse to bring these back for a ‘back to school’ treat! 🙂 Thanks for sharing. They are popular Tara, and delicious 🙂 I’ll head over and check out your version – because you can never have too many cookie recipes! Thanks for stopping by. Haha – I like the way you think Bintu! Lots and lots of oats 🙂 Thanks for stopping by! Thanks Amy – I hope you love them too! These look like they are were the 10-years-in-the-making! Wow, so enticing and delicious looking! Pinning and sharing! I have never tried oatmeal cream pies but I like the look them :). Love the photos! These look so comforting and the creamy middle is perfect! We started back to school today and these would be perfect! Hope your kids have a great year Marjory. School seems to start so early now – but hopefully everybody is happy about it 🙂 Personally I never liked the homework – haha. Thanks for stopping by! So perfect! I’m not sure if we get these treats here in Canada, but never mind now. I can just make yours!! 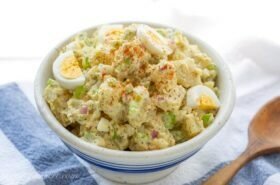 Thanks Jennifer – I hope you get the chance to try my version – such a treat! Have a lovely weekend. They remind me of my favourite oatmeal sandwich cookies :-)) You are an amazing baker, Tricia. 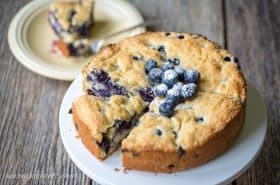 Thanks Angie – I bet you can bake a healthier version that would be terrific too! Have a lovely weekend.